Improving the health your best investment, your team! We provide health management programs that are designed to maximise workplace performance, minimise workplace health problems and related costs to your organisation, and help you create a culture of care and commitment. The effects of poor employee health on Australian productivity cannot be underestimated. For example, unhealthy workers average just 49 productive hours of work per month compared to 143 hour per month for the healthy ones (Medibank Private, 2005). Manage your employee’s health and see the results add up. A large part of remaining healthy is identifying health risks early and making simple, but important, lifestyle changes. Energize Health offer preventative tools (like Employee Health Checks) and management tools (like seminars and one-on-one consultations) to improve the health, and therefore the performance, of your employees. We create “real life” health solutions for your business. During assessment current health, lifestyle and work practices are identified. This provides a framework to deliver effective lifestyle solutions to improve the health, producivity and culture of the business. During the planning stage health, lifestyle and work practices identified can be targeted with suitable strategies. This enables specific program delivery to meet the problems identified by staff. We can target delivery methods for casual and shift workers so the whole organisation can benefit. Effective implementation is about creating a motivated, positive culture that is focused on improving performance and well-being. A committment to improving the health of your workforce can lead to fewer sick days and increased productivity. At each stage of the process evaluation is a key component. Firstly during assessment and then during planning. Evaluation is built into every step of the program. The evaluation of key outcomes includes quality of life, health risks and productivity tied to performance outcomes. 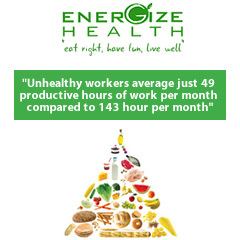 Regular reporting is part of the committment from Energize Health. Including session evaluations, staff health evaluation and risk profiles for your business. To know where you’re going you need to know where you are now. During the program planning stage a number of assessments can be conducted to identify overall health trends in your work force. Quality of life - identifies physical, emotional, social, energy and general health measures of your work force referenced against current national trends. Health Risk factors - diabetes, heart disease and cancer risk assessments can be conducted which include finger prick tests and questionnaire along with blood pressure, weight, waist and heaight measurements. Nutrition Survey to identify current eating patterns and potential deficiencies. Workplace food audit - this is an audit to identify the access to healthy and unhealthy food choices available to staff in an around your workplace. Physical functioning 80 This is the extent to which your health limits the physical activities like looking after yourself, walking, moderate to vigorous activities. The nutrition survey can identifiy early trends in your workforce that can increase the risk of chronic disease. Obesity and poor nutrition is associated with increase sick leave and poor performance at work. The four pilars of good nutrition include dietary fat, fibre, anti-oxidants and balance. 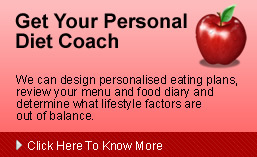 The survey identifies healthy eating trends which can then be modified through effective action. Easy access to unhealthy foods has been shown to increase obesity rates and promote weight gain in the workplace. We can liase with food providers at your worksite, audit vending machines, conduct nutrition analysis of catering services and develop alternative options that promote a healthy workplace. Issues identified in the assessment stage become the backbone to program planning. Tailoring a program that caters for the workplace environment with on-site programs, seminars, newsletters and other programs to help promote a positive difference in your workplace. Here is an example of the type of program that can be implemented for your organisation. Brining the assessment and planning together to provide site specific programs that meet your staff needs. At each step of the process we conduct evaluations to ensure the quality of the programs being provided and the satisfaction of your team. Our reports tie the information obtained in the assessment and planning stage to performance outcomes in your organisation. We take the time to listen to what your business needs and ensure that we make the necessary changes to deliver the services your team wants. Providing timely and accurate feedback about the health your workforce is crucial to managing the future needs of your organisation. We provide reports at each step of the process to identify trends and outcomes that make a difference to how your business works. Please Contact Us On 1300 630 883, If You Have Any Questions Information.